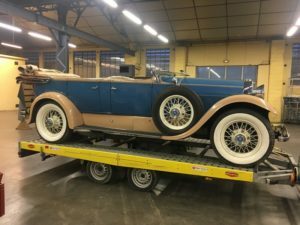 Details : We offer for sale this incredibly rare and collectible 1929 Lincoln Model L. Lincoln’s Model L Type-177 7-passenger Sport Touring was introduced mid-year 1929, this one was shipped by Lincoln the August, 1st, 1929. 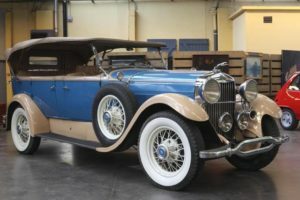 Only 259 of these rare Model L Lincoln’s were produced including a fleet of 17 police cars which were purchased by the Chicago Police Department to keep up with Al Capone and other criminal characters in the windy city. 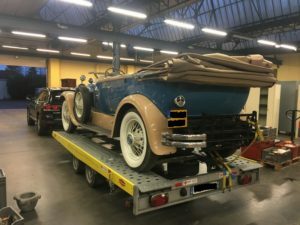 This particular car was imported in France 30 years ago shortly after it’s complete restoration by it’s previous owner in Kentucky. This Lincoln is well preserved, but have older restoration. 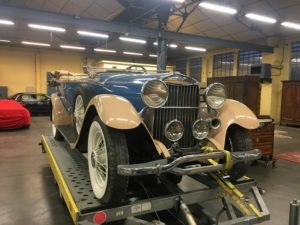 The standards of restoration were not the same as today so the car needs restoration to participate in Concours d’Elegance or can be use in this condition for rallyes and shows. 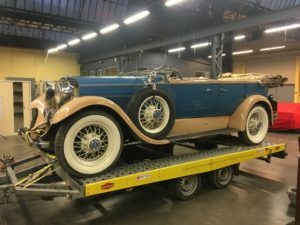 Car has been stored indoors, maintained as needed and used sparingly for parades and local car shows. The car shows some light patina yet is still elegant and lovely as ever. 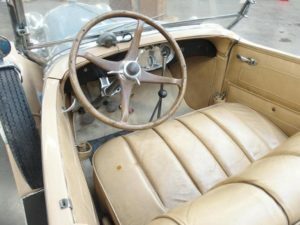 The leather interior is in nice shape as is the paint. The chrome looks good with some aging. The fold down seats are in fine condition. Great opportunity to own a truly rare and collectible piece of history.